The Tetra Art Aquarium comes in 30 or 60 litres. With the clear glass, compact filtration and heater unit, T5 lighting and stylish curved looks, Tetra have been innovative in design with these aquariums. 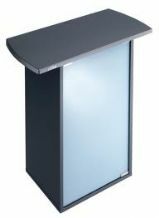 Available in Grey or White, the Tetra Art aquariums have stylish stands available too ensuring your aquarium will take centre stage in your home.